Oh ho ho! It’s the Little Christmas Glitter Bug! I’ll be back again this after noon with some fun links, but first….how hilariously awesome is this random little Christmas Ornament?? I was searching on eBay and stumbled upon her. A pixie caterpillar??? How creepalina is that?!? 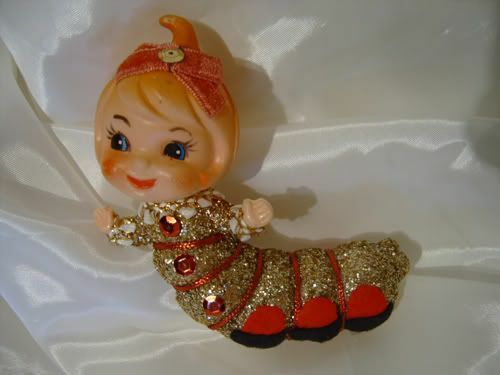 I would have plunked down the cash because she is just so weird and cool, but with shipping she was gettin’ a tad pricey and did I reeeeeally need a pixie caterpillar? Hmmm. I kind of love her though. Shoot. Maybe I should have bid on her. Tagged with christmas, elf, kitsch, pixie. Oh how on earth did you pass her up? She’s perfection! I will from now on call you my little glitter bug! I had a set of these when I was little. The other ones were a beetle, a deagonfly, and a snail. They were hilariously creepy and I completely failed to see that. I wish I still had them.